The master bedroom slash office has been my pet project for the past month. It’s still far from done, but I’ve changed more in the last month than I have in the past year. It’s gratifying to get something done, right? I’ve had plain white IKEA curtains up since we moved in. When we moved into this house (which has LOTS of windows), I just went with white curtains everywhere because 1) They’re cheap at IKEA, 2) I didn’t have to think about it too much, and 3) White goes with everything. White does get a little bland though, especially in this room where I don’t have anything up on the walls yet. 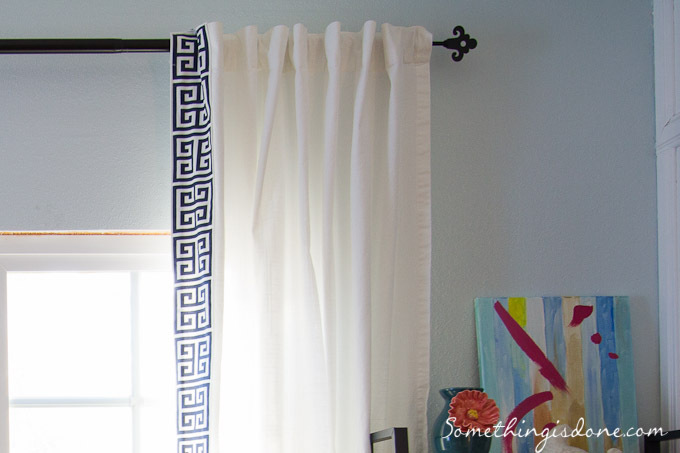 So I decided to glam up the curtains a little bit with Greek key trim, inspired by this image from Pinterest. Did you know that Greek key trim is expensive? 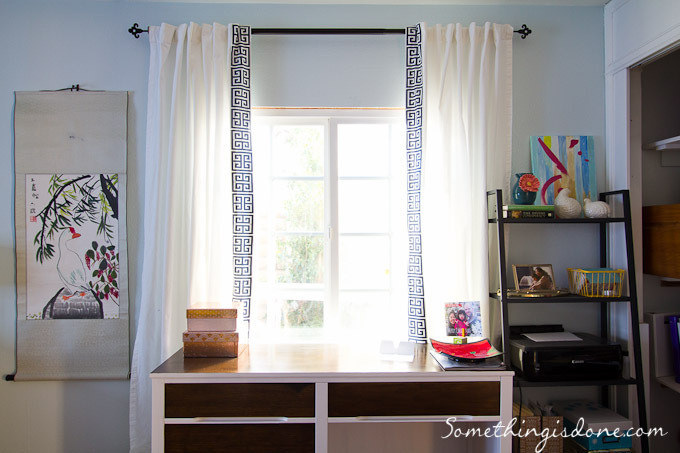 Especially the 3″ wide trim I was looking at, especially enough to do 4 curtain panels? 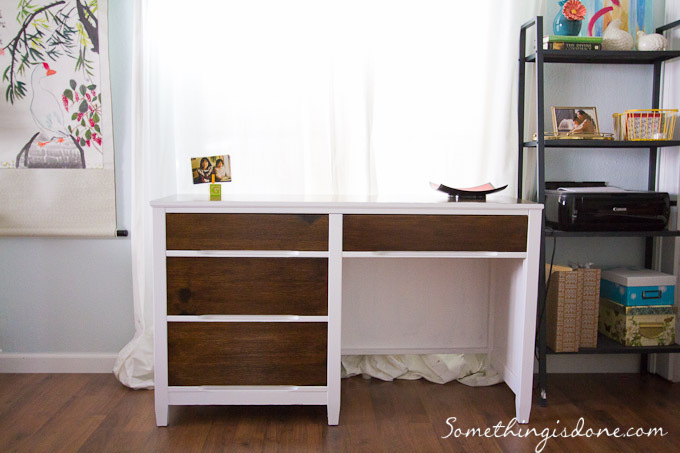 Then, I found this awesome post by Bethany at Dwellings by Devore and I found my solution! She simply ordered a few yards of Premier Prints’ Towers fabric, which has a Greek key-inspired pattern on it. She cut the fabric into strips, folded over the raw edges, and sewed them to the edges of her curtains. Genius! I ordered 3 yards of navy Premier Prints fabric from Fabric.com (at just $8 a yard) and did just that. Tadaa! A headboard, for example, would be nice. 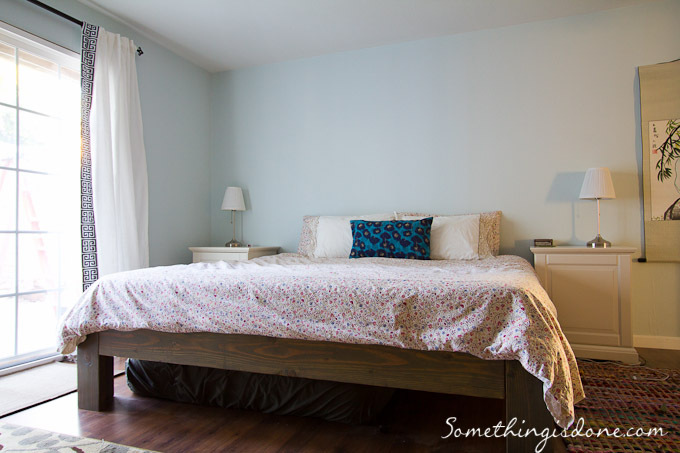 (Psst, instructions for building the DIY king-size bed frame are here). And some art or other decorative element above the bed. But definitely something simple. I like the spare, serene feeling in here and don’t want to lose it. What do you think of my little budget Greek key trim update? An easy way to bring a graphic element into a room, right? Sharing at VintageRevivals, TheBlissfulBee, TinySidekick! What a great detail. I love Ikea curtains too. They are so easy to spruce up. You did a beautiful job. Don’t forget to link up at The Makers! We loved your desk last week and would love to have you back! 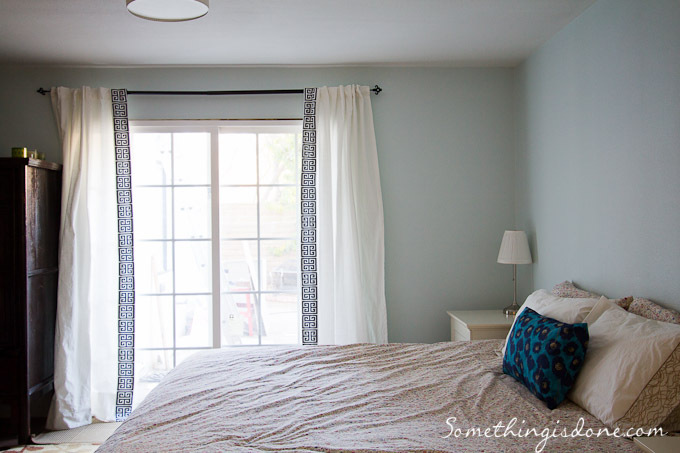 I love how the trim adds so much to the simple IKEA curtains. I do love sprucing them up a little! And how smart to use fabric. I’m featuring you tomorrow morning at Work it Wednesday! I’d love for you to come by and grab a feature button if you’d like!